Kuchinoerabu-jima (口永良部島 本村西) volcano is one of the active volcanoes of the Ryukyu Island arc, Japan. The 4x12 km wide island is sparsely populated and located 15 km west of Yaku-shima. All historic activity which consisted in frequent explosions recorded since 1840 took place from Shin-take, but there is a young, but undated lava flow from the south flank of Furu-take that reached the coast. The largest eruption in historic time occurred in December 1933 and caused damage in several villages located only a few km from the active crater. Вулкан Kuchinoerabu-jima: Консультативный центр по вулканическому пеплу: POSS VA CONTINUOUSLY OBS IN SATELLITE IMAGERY. Close-up webcam image of the pyroclastic flow, which seems larger than it was in this view. Credit: Still image from JMA webcam. Following renewed unrest and a minor eruption beginning last August, earlier today a more significant explosion occurred, sending ash to 20,000ft (6km) and generating a moderate pyroclastic flow which travelled 1.5km (~1 mile) down the southwest flank, though fortunately did not affect adjacent communities. No injuries have been reported and this event was smaller than the powerful explosion in 2015. JMA has kept the alert level at 3 (on a scale of 1-5). The early part of the explosion. Credit: Still image from JMA webcam. A new and very small eruption is occurring, with ash plumes rising only a few thousand feet above sea level. This follows the unrest in August, when the Alert Level was raised to 4, as there were concerns about a repeat of the large explosion in 2015. This subsequently declined, the Alert Level dropped to 3, where it remains. Текущий уровень был снижен с второй высокий на шкале (4: «подготовить для эвакуации») в настоящее время 3 («не подход вулкан»). All islanders have been evacuated and there are no reports of fatalities. 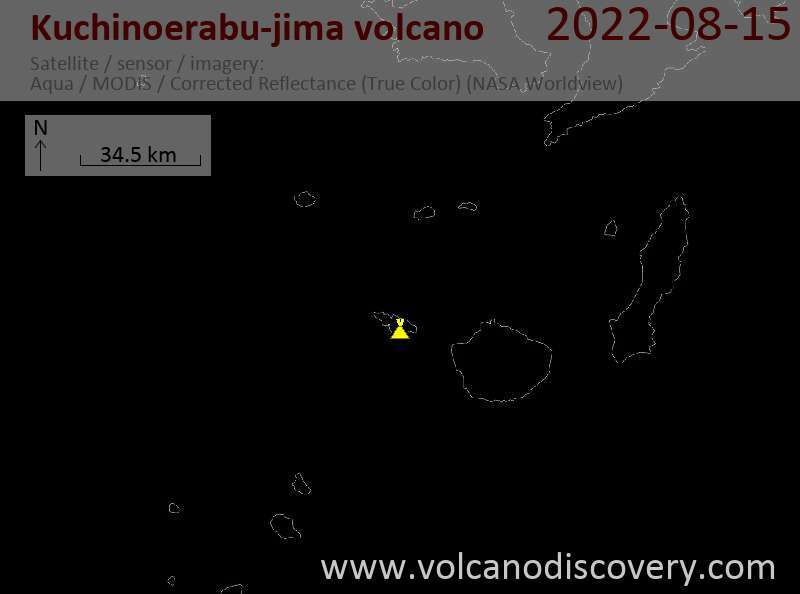 The Japanese Meteorogical Agency (JMA) believes that the eruption, which occurred at 09:59 local time, was phreatomagmatic in origin. A local earthquake occurred just under a minute before the explosion. So far, it is not clear whether the eruption is a large-scale phreatic (steam-explosion driven) event or caused by new magma. Ash analysis should bring light into this soon. Накаливания можно увидеть из кратера вулкана, предлагая мягкий активности (например, релиз очень горячие газы) продолжается. С момента своего последнего извержения в августе 2014 вулкан остается на уровень оповещения 3 (из 5). Взрыв был вероятно извержение в типе, причиной внезапного высвобождения накопленной избыточного давления газов содержащихся в вязкой магмы под прочной вилкой. Она длилась около 10 минут и большую часть вспыхнули массовые рухнула в впечатляющие Пирокластический поток (горячие лавины фрагментированных лавы и газов).